This kit is designed to provide irrigation for up to one acre. Kit includes a large T filter with 2" inlet/outlet, utilizes 2" layflat hose for the mainline and includes fittings for up to 40 rows of drip tape. An itemized list of parts included in this drip kit can be found below. Unfortunately, since every system design varies, we can't know what is needed for connecting to your water source or what your system may need to get from your water source to your field header row. Please Note: Although the kit includes everything to install a complete system, your design may require additional components to connect the filter to your water source and connect your filter assembly to your layflat header row. These components must be purchased in addition to the kit. Drip Depot drip irrigation kits are completely modular in design. 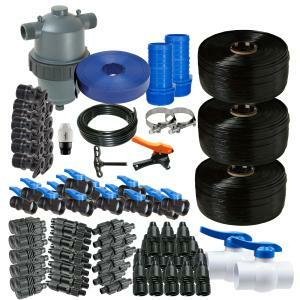 Even though this kit is completely self-contained and will work perfectly right out of the box, there is nothing stopping you from adding additional irrigation parts to this kit as long as you stay within the capacities and limits of the individual drip irrigation components. This means you can mix and match parts to achieve exactly what you want out of your new drip irrigation system. If you are not sure which kit is right for you, just add this kit to your compare list to get a side-by-side comparison of two or more kits to find the kit that is perfect for your needs.